The Central District has established and implemented a policy authorizing reimbursement of out-of-pocket expenses incurred by Court-appointed attorneys providing pro bono representation in civil cases (the “Policy”). Eligible counsel seeking reimbursement pursuant to the Policy must submit a “Request for Reimbursement of Out-of-Pocket Expenses” form following the procedures set forth below. Requests for reimbursement may be made either during the course of the litigation or after its conclusion, but no later than 30 days after judgment has been entered. Any attorney appointed by the Court to represent, on a pro bono basis, a previously pro se party in a civil case (“Pro Bono Attorney”) may seek reimbursement under the Policy. A Pro Bono Attorney seeking to recover out-of-pocket expenses of up to $10,000.00 per case must complete a “Request for Reimbursement of Out-of-Pocket Expenses” form, setting forth the nature, reason, and amount of each expenditure, and supported by invoices and actual receipts or copies thereof. Forms are to be submitted via email to the staff attorney who manages the pro bono appointments on behalf of the court (“Staff Attorney”). Do not file the forms. As administrative forms they will not be made part of the case file and will not be available to the public or other parties in the case. The Attorney Admission Fund Board has the discretion to make exceptions to the $10,000.00 per case limitation. If reimbursement of more than $10,000.00 in expenses is sought, the Request for Reimbursement of Out-of-Pocket Expenses must be supplemented by a detailed explanation of what expenses have been reimbursed in the case to date, what the additional money is to be used for, and why, in the context of the litigation, good cause exists to exceed the $10,000.00 maximum. The Request for Reimbursement of Out-of-Pocket Expenses, with the supplemental information, must be submitted to the Staff Attorney, who will present the request to the Attorney Admission Fund Board for a vote. Unless otherwise ordered by the Court, any out-of-pocket expenses reimbursed under the Policy must be repaid to the Attorney Admission Fund when a judgment, settlement, or award of costs results in a monetary award to the party represented pro bono. This repayment must be made prior to any disbursement to counsel, plaintiff, or any other person. 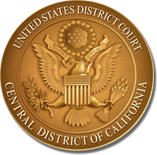 Completed forms and all inquiries should be emailed to ProBonoPanel_cacd@cacd.uscourts.gov.